With so many new worlds to explore in Insula (the name of this isolated region of space), your captain on board the Odyssey has decided to send individuals to various Federation worlds to make general observations and catalogue the different biomes present. The scientists on Earth will want to study it all, once you eventually find a way to contact them again. Your assignment is a mountainous world called Terragast. Your guide to Insula, a Lackerdood named Amele, recommended that you bring sturdy shoes, an extra climbing harness, and a package of your favorite preserved herbs and spices, which you've carefully loaded into a shuttle along with enough standard supplies to last a month. 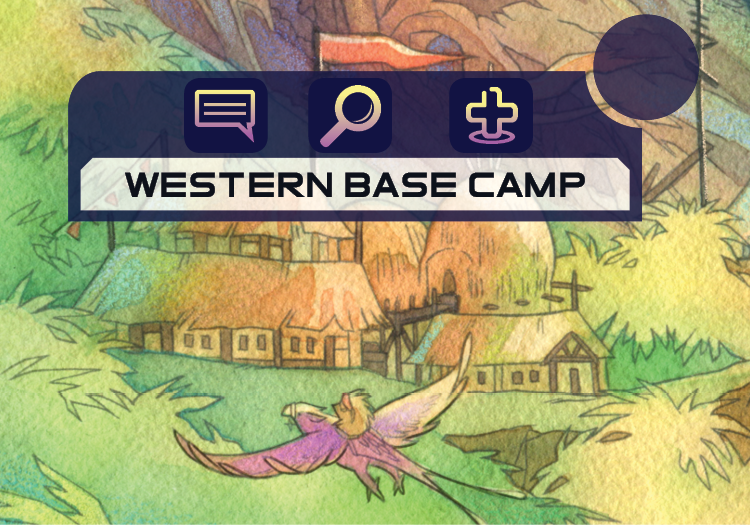 "You should go say hi to the folks at the Western Base Camp," she had said. "They'll show you all the best observation spots." You cheerfully set off in your shuttle, excited to explore your new surroundings. Now you have finally finished carrying your gear up from the landing pad to the Western Base Camp. Durable tents and sturdy cabins fill a small hollow at the foot of the dizzying Mount Goliath. Sturdy green plants cover the rocky soil, resilient even in the chilly air, and you make appropriate notes in your data tablet about it while you look around camp. A sign hanging from the largest cabin proclaims "Home of Argochus's Famous Stew" with "caretaker's cottage" added below in small letters. And, though the camp looks quiet for the most part, you see a pair of knee-high potato-looking folks walking by on spindly legs. Two Zibzabs, according to the almanac Amele lent you. (43%) Visit the Caretaker's cottage. 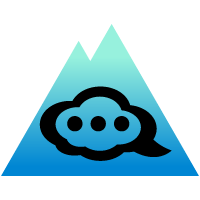 (57%) Talk with the Zibzab hikers. The Zibzabs abruptly cease their conversation as you approach, narrowing their large eyes warily. "Hmm. Human?" one asks the other softly. "Yes," the other responds. "I read the article in Extra-Braxiconian Lifeforms Journal. Seems to approximately match the included diagram." The first one clutches some research tablets in her stick-thin arms. "Will they steal our research findings?" she asks. "Seems unlikely," says the second. "They're not a rock-eater, that's for sure." You see their mouths moving some more but are unable to hear them. "Yes, how can we help you?" the second Zibzab shouts loudly. "I'm Hotrok. A friend." You ask at a normal speech level about the best places to study the different biomes of Terragast. "Hmm," the second Zibzab frowns. "It seems the Journal underestimated your hearing. I will notify them. To answer your question, the most interesting things to study on Terragast are the mountains. So many beautiful rocks, in such great variety! However," he looks you over, "you look squishy enough that a climbing permit will be required of you. I would also recommend the Stone Heart Caverns for a detailed look at --" "Munchers!" the first Zibzab interrupts. "Stone Heart is full of very dangerous, hungry, drooling munchers." She makes a clawed gesture with her hand suggesting fearsome teeth. "Don't go there. Get a permit from the Doctor and climb up the mountain instead. Beautiful views and stunning rocks, who could ask for more?" You have gained a Conversation momentum. In 1001 Odysseys, paragraph results will add Momentum Cards to your Mission Control Board, representing the way in which you've made progress. Your choices decide what happens immediately, and they also affect events down the line! (50%) Visit the Caretaker's cottage. (28%) Visit the Doctor to get a permit. A bell tinkles overhead as you enter the caretaker's cottage, and a tall, blue-skinned Lackerdood walks into the room holding a soup ladle. "Hi, I'm Argochus," he says, shaking the ladle. "Stew's not ready yet, I'm afraid, but I can help ya' settle in. You'll want a tent for your gear, right?" He looks at a desk-mounted interface. "And the scanner isn't picking up a climbing permit on you.” He sighs. “Getting to the top of Mt. Goliath is the most challenging climb in all of the Federation, but the view from the top is like no other. Camp doctor can do a physical--" A sharp buzz from the next room interrupts him, and he disappears for a moment, clanging around in what must be a kitchen. "Still not ready," you hear him mutter. He returns, this time without the ladle. "The seasoning's not right yet. But, like I was saying, I can't give you a permit to go up the mountain until someone from the staff is convinced you can handle it. Either the Doc’ll see you, or you can help me with some chores that'll show you're fit.” He pauses to look you over. “Gathering herbs in the Terrafern Valley seems about right. 'Course, you're free to wander the valley with or without a permit. It's just gettin' the herbs that's tough." You have gained another Conversation momentum. In the game, momentum cards are applied to specific missions, and will combine to form letter-codes that will let you look up the results of that mission to see what happens next! (60%)Gather herbs from the Terrafern Valley.